the middle east. 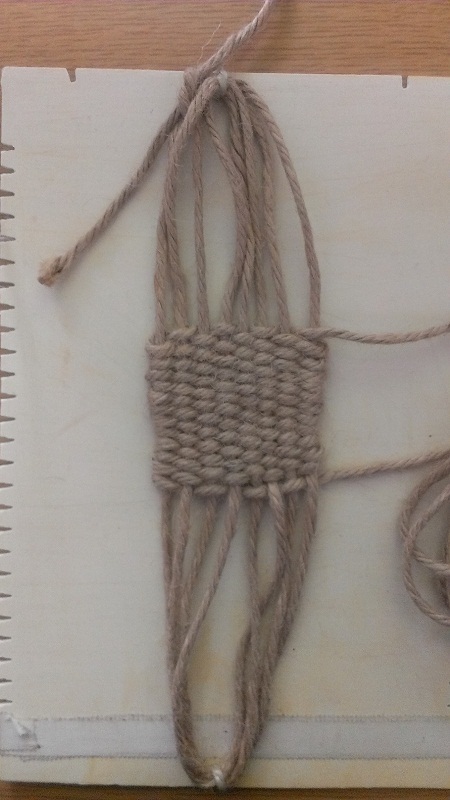 It´s called #1, because it`s about the basic method with a simple and one coloured weaving. 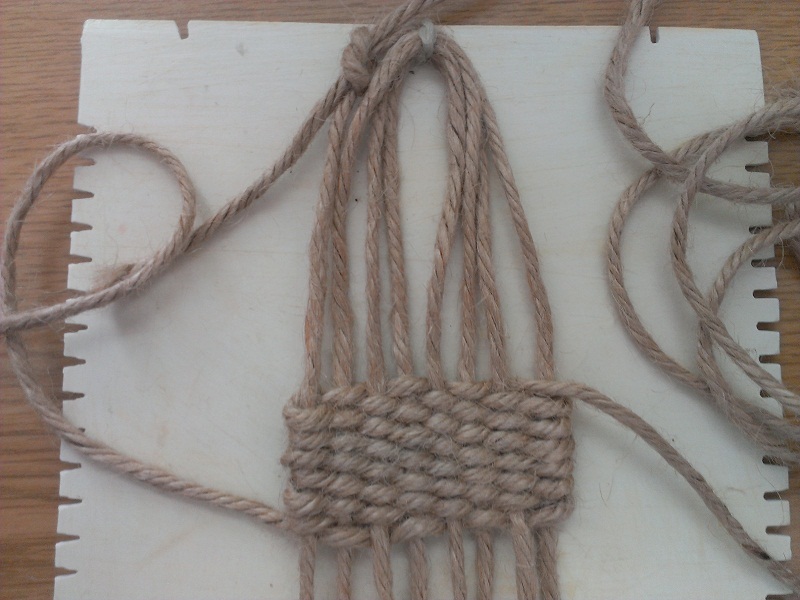 Other tutorials which show more advanced methods and more complicated weaving patterns will follow. On the picture below a finished example is seen. 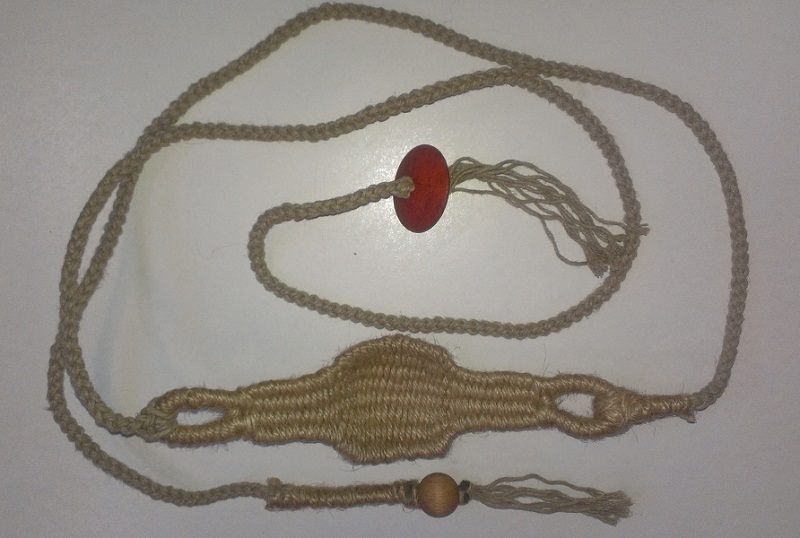 You need about 8-9m of cordage for the pouch, a knife or scissors, a weaving needle (every big needle without a sharp tip is o.k. 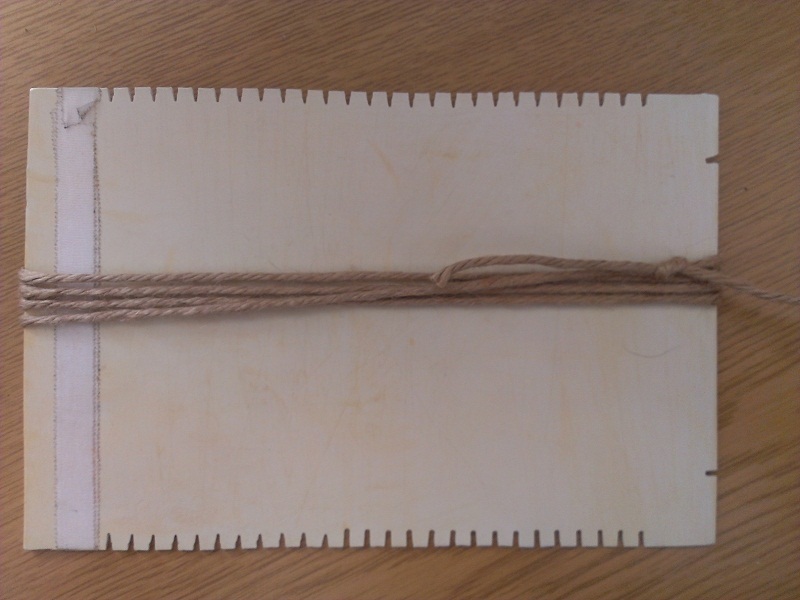 ), an additional piece of cord (~40cm), some glue and a flat piece of hard paper, plastic, wood or something similar. I took here the loom that I use for making the Tut-slings, that is nothing else than a piece of plastic with many cut-outs. 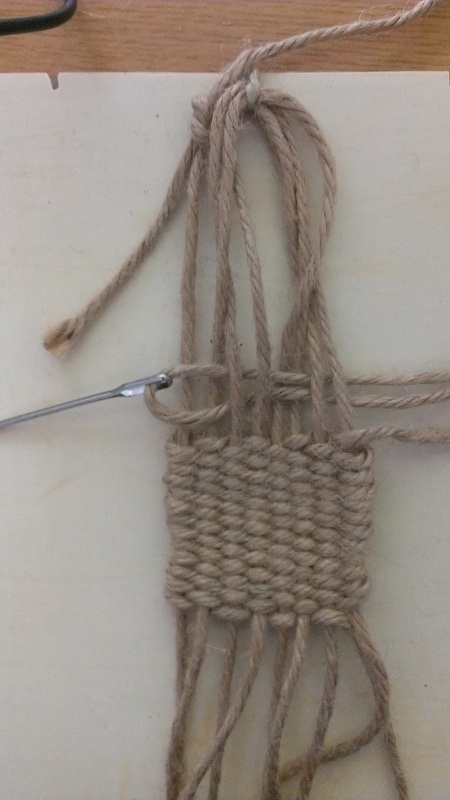 If your "loom" has the length of the future pouch, then take the cord and make 4 complete turns around the "loom", otherwise make this step free hand. Make a knot. 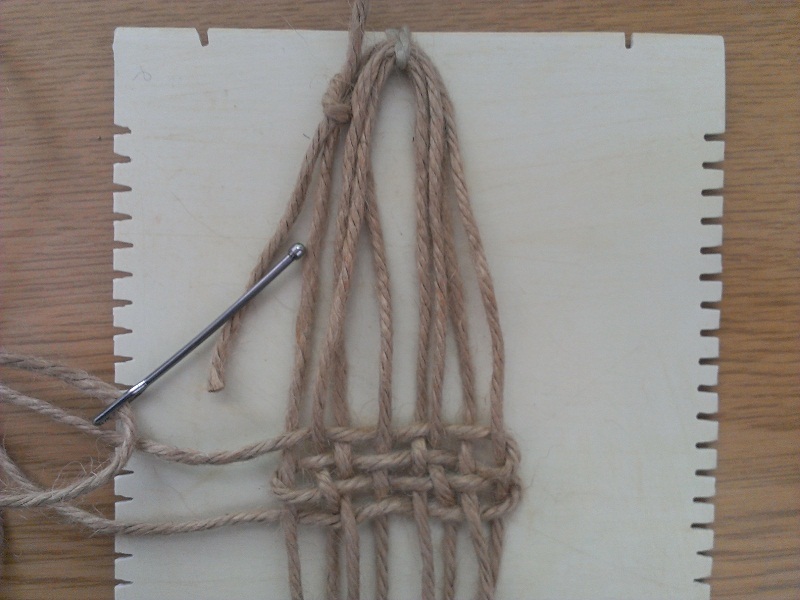 Remove the cordage, so that it isn`t bent around anymore and lay it on the upper side of the "loom". 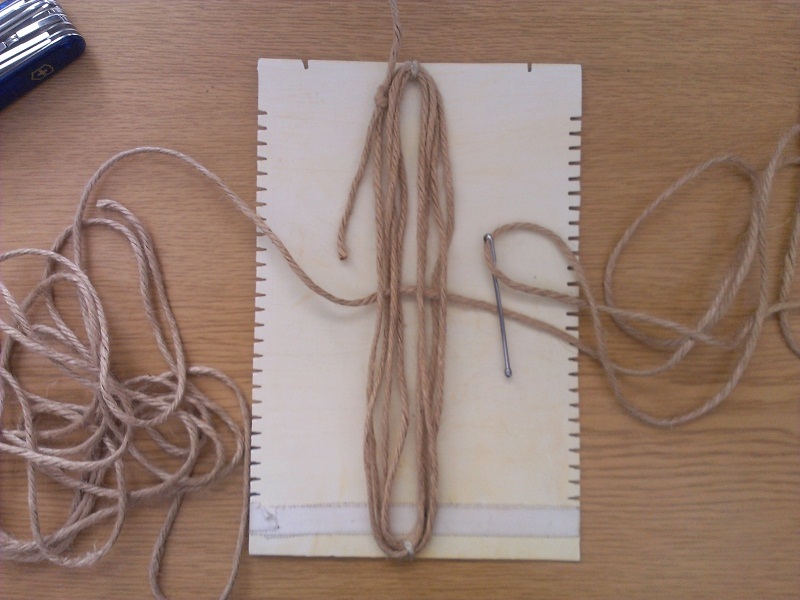 Use an additional piece of cord to fix the cordage on the "loom" like shown. Now you have 8 warp cords, that should not be under too much tension but also not too loose. 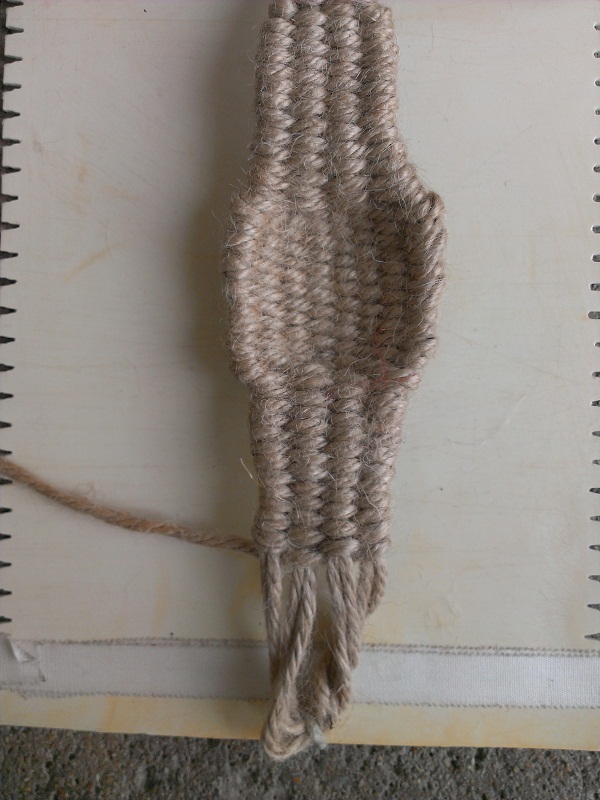 As you can see, the weaving begins in the middle height of the warp cords. 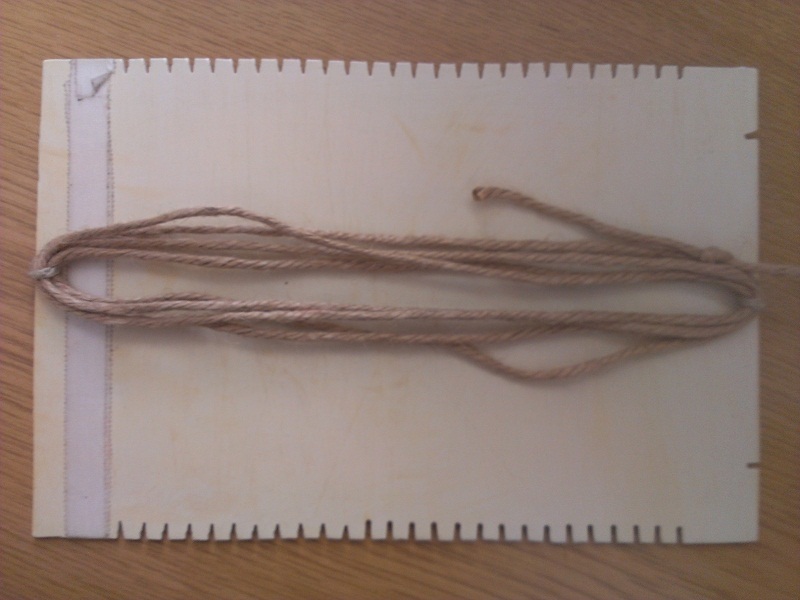 Pull the weaving strand through, until both (left and right) ends of it have the same length. Now you will continue with the right end (the one with the needle) weaving upwards of the first row. Here 4 rows are woven. Don`t weave too tight, but make sure every row is as wide as you want your pouch. This is crucial, even if the weft seems very loose and weak to you. The tightness will come later. Pusch the rows together, using the tip of the needle or your finger. Continue weaving until you made 13-14 rows. Push them now together tighter than you did before. You may hold one or two warps above the rows and push the respective part of weaving to the bottom it moves downwards and tightens. 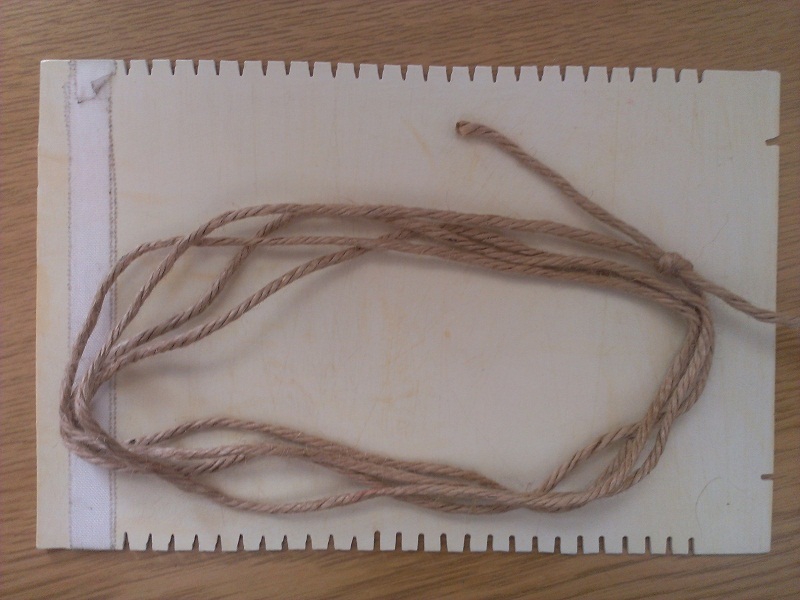 Repeat this for every warp until your weaving is dense and regular. Be careful that you don`t push the rows to hard, otherwise you could pull the warps through too much. 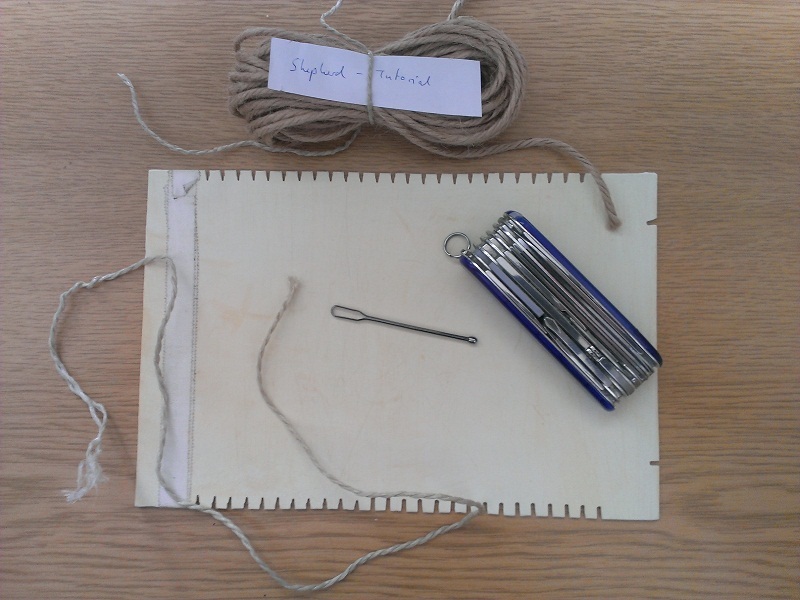 Now change the needle to the other end of your weaving cord and start weaving downwards. Weave the same amount of rows as you did before. 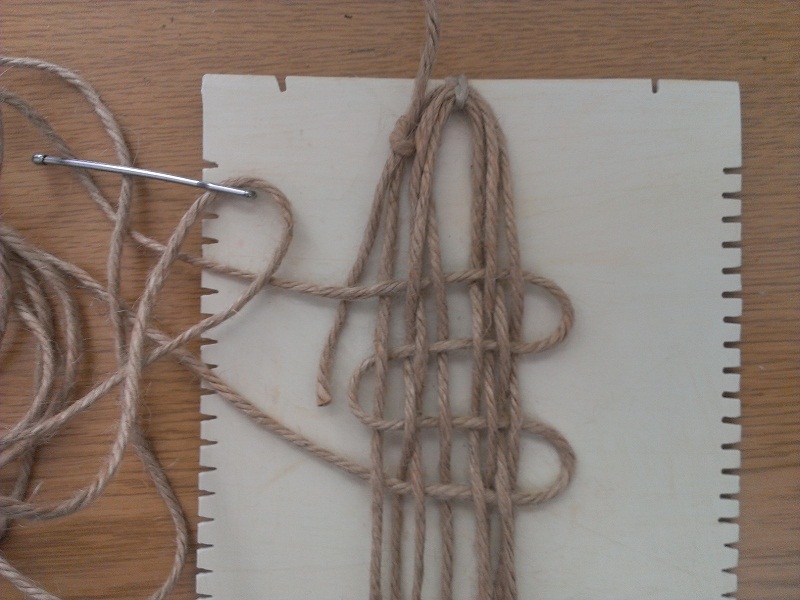 Change the needle again to the upper weaving cord and start weaving over two warps. For the first 4-5 rows weave every row tighter than the row before to slowly reduce the width of the pouch. 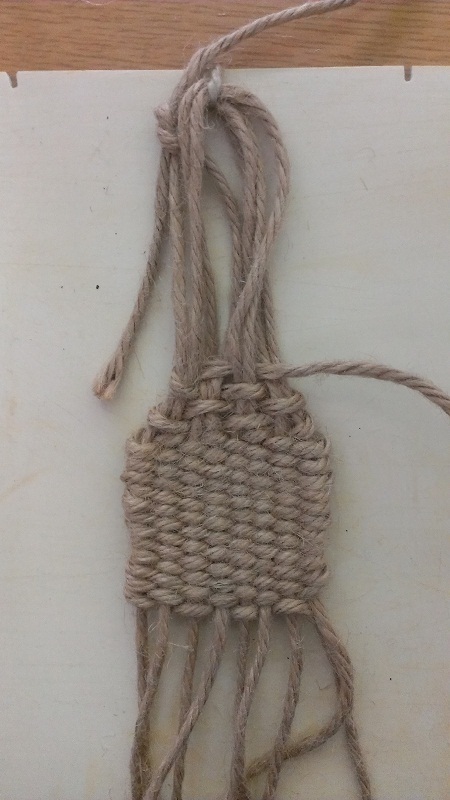 After having reached the desired width of this part of the pouch continue weaving until the weft reaches a length that is equal or longer than the pouch center. 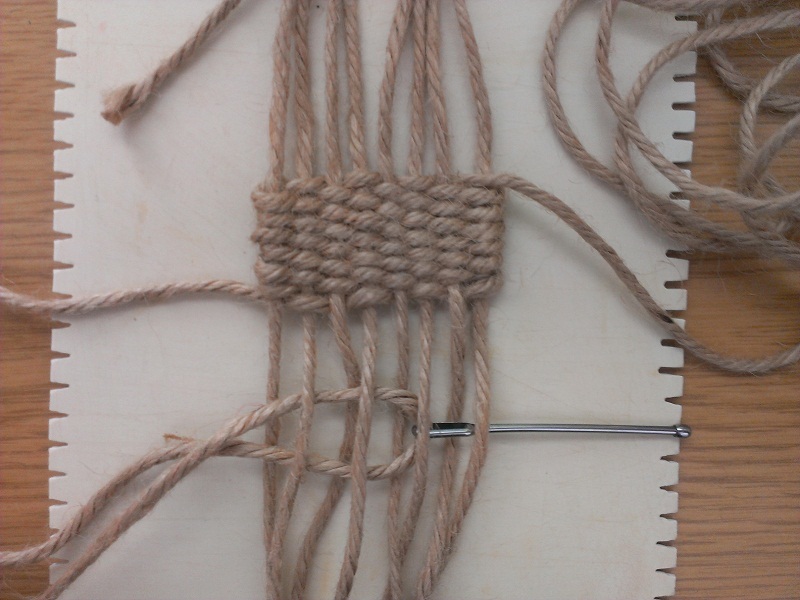 Tighten the weaving as described before by pushing the rows to the center while pulling or holding the warps. Here you`ll note that the center begins to shape to a slightly cupped form. 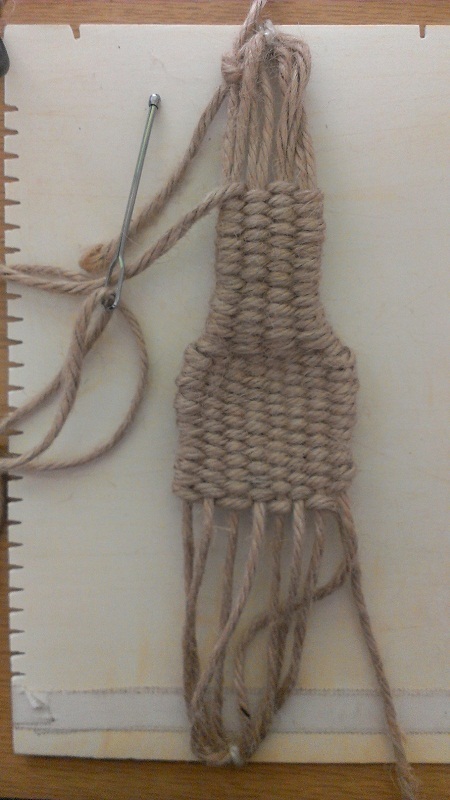 Repeat the weaving over two warps on the other side until the pouch becomes symmetrical.